I had to watch this a few times, as I am so in awe of the beauty of something made entirely of plastic serving ware. Rather than being embarrassed by the fact it is homemade and cheap, you can truly show off this gorgeous project and proudly tell people it is made from plastic. Only if you get close to it can you tell what this amazing light fixture is actually made from. If you are in need of something amazing to add lighting to your dining room, living room or bedroom, we think we just found it. One of the most impressive DIYs I’ve seen lately, this idea is definitely a keeper. I love being able to use some of my plastic items I’ve saved from takeout restaurants, too. 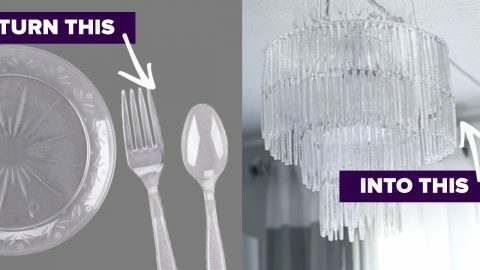 This can be made entirely from trash or repurposed items that were free, ie the forks and spoons the Chinese takeout delivery service always gives you too many of. What a great use for them, and a nice thing to put to use rather than throw away.